It’s not easy saying “not my circus, not my monkeys” when those darn monkeys are so good at flinging poo. It happens. It stinks. Don’t fling it. Don’t roll all around in it and believe that the smell will attract something positive. Even if you were wearing a diaper, as a containment method, you wouldn’t change it…because your hands are tied. You feel like you have no one to hold you? Welcome to the club. You feel like you have nowhere to go? That’s a great place to start a journey. You’re going to need something much bigger than yourself to lift you up out of this and clean this mess. As much as I’ve enjoyed this type of show, in the past, it just doesn’t make sense anymore. Audience of one for a monkey with a ringmaster complex? No thanks. In the past, I would have paid extra for seats in the poo zone. I give away my tickets and all future benefits of being a season ticket holder. Seasons change and the show will improve. 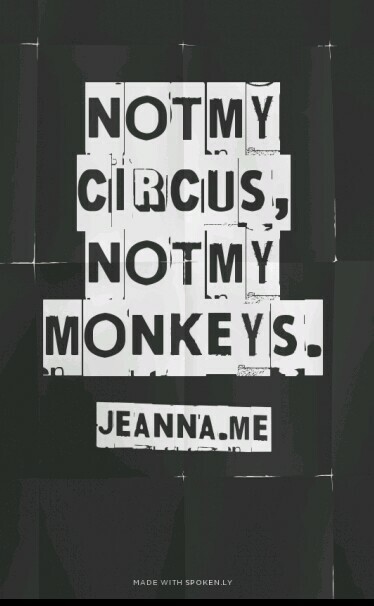 But it’s not my circus to attend. I want a circus where the Lion tamer cleans up after the monkeys…because the Ringmaster is within. And yeah… This is me not being very nice. Because I’m hurting, I’m praying, and I’m missing out on something too. You know, transparency and all that. ← You get what you get and you don’t throw a fit!